Fusion protein, corresponding to amino acids 400-460 of Human ATR. Our Abpromise guarantee covers the use of ab2905 in the following tested applications. IP Use a concentration of 2 mg/ml. WB 1/1000. Detects a band of approximately 305 kDa (predicted molecular weight: 309 kDa). (in lysate from UV irradiated K562 cells). Serine/threonine protein kinase which activates checkpoint signaling upon genotoxic stresses such as ionizing radiation (IR), ultraviolet light (UV), or DNA replication stalling, thereby acting as a DNA damage sensor. Recognizes the substrate consensus sequence [ST]-Q. Phosphorylates BRCA1, CHEK1, MCM2, RAD17, RPA2, SMC1 and p53/TP53, which collectively inhibit DNA replication and mitosis and promote DNA repair, recombination and apoptosis. Phosphorylates 'Ser-139' of histone variant H2AX/H2AFX at sites of DNA damage, thereby regulating DNA damage response mechanism. 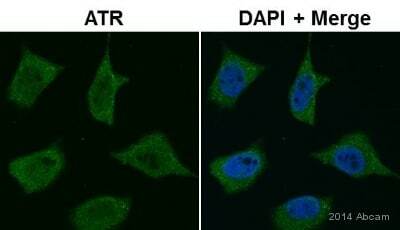 Required for FANCD2 ubiquitination. Critical for maintenance of fragile site stability and efficient regulation of centrosome duplication. Ubiquitous, with highest expression in testis. Isoform 2 is found in pancreas, placenta and liver but not in heart, testis and ovary. Defects in ATR are a cause of Seckel syndrome type 1 (SCKL1) [MIM:210600]. SCKL1 is a rare autosomal recessive disorder characterized by growth retardation, microcephaly with mental retardation, and a characteristic 'bird-headed' facial appearance. Belongs to the PI3/PI4-kinase family. ATM subfamily. Nucleus. Nucleus > PML body. Depending on the cell type, it can also be found in PML nuclear bodies. Recruited to chromatin during S-phase. Redistributes to discrete nuclear foci upon DNA damage, hypoxia or replication fork stalling. 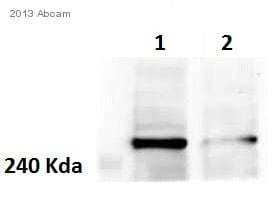 Western blot on ATR in K562 whole cell lysate using ab2905. 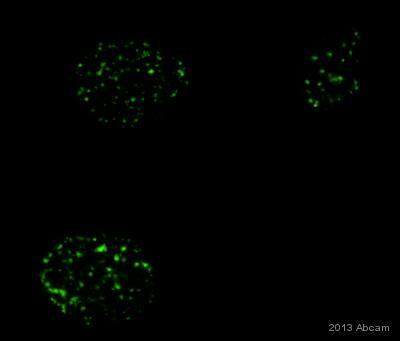 ab2905 staining ATR in the U2OS cell line from Human Osteosarcoma by ICC/IF (Immunocytochemistry/immunofluorescence). Cells were fixed with Formaldehyde, permeabilized with NP-40 and blocked with 3% BSA for 60 minutes at 21°C. Samples were incubated with primary antibody (1/500 in PBS + 3% BSA) for 12 hour at 4°C. 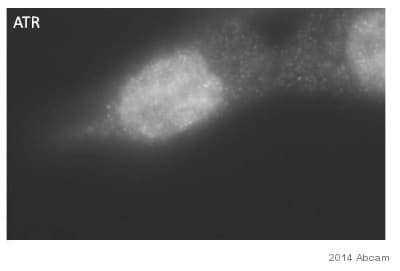 An Alexa Fluor®488-conjugated Donkey anti-rabbit IgG polyclonal(1/500) was used as the secondary antibody. 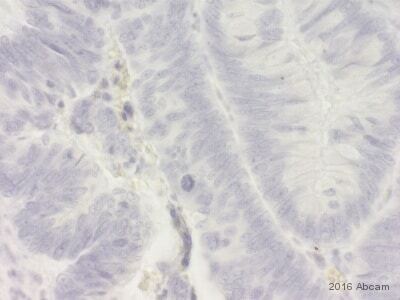 Lane 1 : MCF10A breast epithelial cells, grown in normoxic conditions (20% O2). Cells were lysed with NP40. Lane 2 : MCF10A Breast Epithelial cells grown in hypoxic. conditions (5% O2). Cells were lysed with NP40. Blocking: Carried out using non fat dry milk for 1 hr at room temperature. This image is an edited version of an image submitted courtesy of an Abreview by Francisco Ramirez-Valle submitted on 15th November 2005. We do not have any further information relating to this image. Publishing research using ab2905? Please let us know so that we can cite the reference in this datasheet. I have a question regarding the protocol. 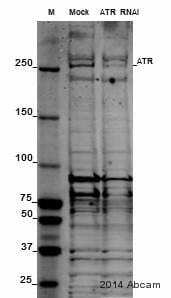 Is it better to use a nitrocellulose membrane or a PVDF membrane for this antibody. That is really up to you, and what you want to do with the membrane: PVDF membranes tend to show a higher background, however, PVDF tends to be slightly more robust during handling and is easier to strip, whereas NC binds the protein stronger, but is more fragile during handling and not stable against organic solvents (if in contact by chance), and you can easier blot through.